The vintage Rancor Keeper was not one of the more popular figures in the line. Who knew that little boys wouldn’t want a figure of a half-naked fat guy? Towards the end of the vintage toy line’s lifespan, Kenner was left with large numbers of this guy unsold. Palitoy, the UK distributor for Kenner Star Wars toys, ended up literally giving them away. As you can see on this flyer, you would get one free if you bought six action figures. No, let me correct that. 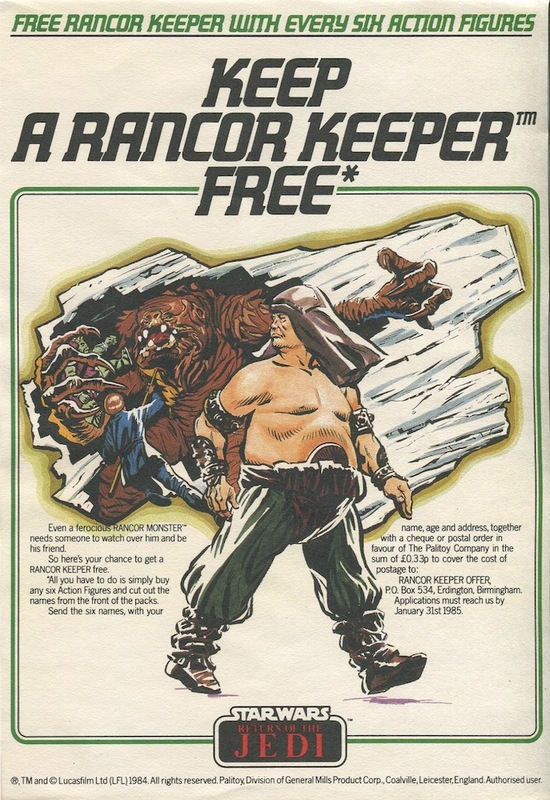 What it says is that you get a “free Rancor Keeper with every six action figures,” which implies that they expected people to be sending away for multiple Rancor Keepers. Wow. Heck, even I think one is probably plenty. I’m surprised these didn’t go as i remember wanting new SW figures as a kid. Still maybe that was the collector in me.